More mystery and strangeness afoot, as Paper Girls delivers on its second issue..
We return to this crazy 80s paper route of neighborhood mysteries and supernatural suspense. So far, we have yet to solve the mystery of the “Apple” device, weird skies, the hooded cyborg monster/alien/not sure. The new issue stacks more upon the strangeness; a flock of giant killer birds, another mystery person, a murder and more. Also, the adults are seemingly gone for now, except for one so far as we meet later on. The question begs, what the heck is going on? But there in this otherwise mundane suburban environment, is part of the fun. Our team of young Paper Girls engage in some rational discussion on these local happenings, and their place among them. We also learn a bit more on most of our leads. Mac takes charge, with shared assertiveness and a survivalist attitude; perhaps learned from having a dysfunctional family. KJ seems a bit more of an outside thinker, contemplating the fantastic with half-plausible ideas of mutants and time travel. Erin expands more with her pop-culture nerdiness, with some references above the heads of her friends. I also love how she notes the Star Trek IV movie as more of a fantasy tale than science fiction. 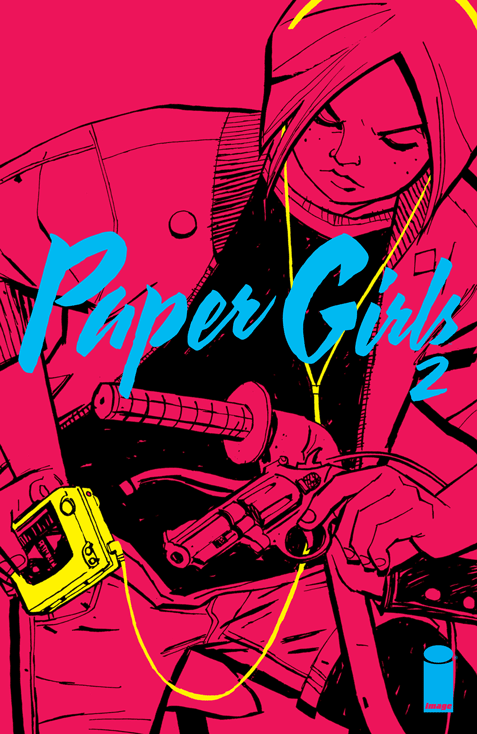 Which leads me to think of the big overall question, to what category this world of Paper Girls will develop into. Is it science fiction? Is it fantasy? Is it horror? Maybe its all or something else more philosophical. There are many genre elements at play, which opens the more possibilities of a far bigger story than our teenage girls can foretell. Readers can join on the fun, with an alien language to decipher and little clues found as objects throughout. Where does it all lead, and how will this book be defined is anyone’s guess. But first, an interruption and an emotional toil for Mac, as her stepmother steps in. Things get quite serious and dark, leading to an ending which may bring a little harsh reality to this world of make-believe; and extra character development. Alicia is an interesting element of tension, as an adult who comprehends less of the supernatural and descends more on madness. This, I feel adds to the classic 80s storytelling trope that adults are not all right, and the kids are. Which leads the question, do we care? Yes, I do. It’s beautiful to see this kind of interruption into character development, with hints to what’s really going on, as we have allusions to demons and occultism; as hinted at in the dream sequence in issue #1. Or, are there aliens and time travel elements in the works, as hinted at in other parts? Is there a twist that perhaps, or something else in the works? Brian K. Vaughan only knows for sure, as I have faith in his writing of a compelling answer to it all. The art stands well, and consistent with my review on issue #1. The defined look of solid inks and impressive digital colors continues to deliver style and a distinct atmosphere. There is not so much more to say on that, other than I really enjoy this look. I feel a bit impatient now for issue #3. I feel a little more excited and curious to what the full story will be, and how these Paper Girls will lead us into that. Still, it’s hard to say whether I really applaud this series as a whole this soon, until I see the payoff in later issues on development of plot and characters. However, I do enjoy the pacing of this issue, kept to a short time and focused more on internal character developments.